I have always been a big fan of Jerry Quarry. He was a mainstay in the talent laden heavyweight division during the late 1960s and into the 70’s. His multitude of fans shared in his triumphs and his disappointments throughout his roller coaster career. Whenever you counted Jerry out he would win a major fight to propel himself back to the heavyweight forefront. His victories over Floyd Patterson,Thad Spencer,Buster Mathis Sr.,Mac Foster,Ron Lyle and Earnie Shavers always kept him in the thick of the heavyweight title picture. Then there were the losses to Ali and Frazier who both defeated Jerry twice. There were the losses to Jimmy Ellis, George Chuvalo and later in his career to Kenny Norton. Much has been documented on Jerry’s career and his battle later in life with Dementia Pugilistica. A battle that would take his life in 1999. The authors of this book do a tremendous job of detailing Jerry’s life and career from the beginning to the bitter end. It brought back a lot of memories both good and bad but it also reminded me of why I was such a fan of Quarry and that era of heavyweight boxing. This is more than a book on Jerry Quarry. It was like reading and reliving that historic time frame in fistic history. Other then Muhammad Ali himself,no one stirred the pot of controversy better then Quarry during that time frame. Along with his great boxing ability Jerry had something else. Loads of charisma that most of today’s heavyweights lack. I highly recommend this book to all boxing fans. It is a great read. 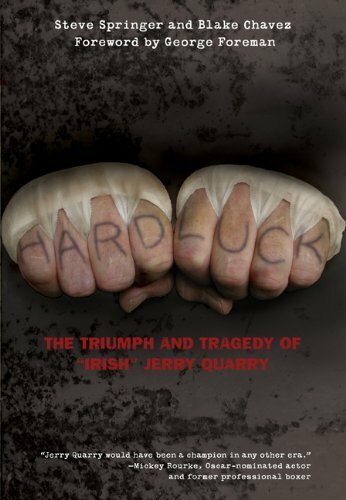 If you are a Jerry Quarry fan…Well what are you waiting for ??? In early 1999, I was watching ESPN, hoping to hear the result of a fight that had taken place earlier in the evening. When the sports news came on, I waited thru football scores, and golf, until the sportscaster finally said . . . “And now from the world of boxing”. I expected a report on the fight. Nothing else going on in boxing at the time. Instead, I heard something that made me forget about the fight result I’d been waiting for. I still remember the words . . .”A sad note to report in boxing today, former heavyweight contender Jerry Quarry has died at the age of 53.” I was stunned. I was aware that Jerry had not been doing well and suffered from Dementia pugilistica. I knew that he had been living with his mother Arawanda in a mobile home park near the Hemet area of Southern California and was under her care. Mutual friends from the past, such as former middleweight Mike Nixon, Jerry’s brother-in-law, had told me that Jerrycould no longer handle simple daily tasks, such as shaving. Jerry’s older brother Jimmy would help him with such things. I remember how sad it was to hear this a couple years back, and that Jerry would no doubt die young. However, I couldn’t imagine him dead at 53. I wasn’t the only person surprised to hear of Quarry’s death. However, in my case it was something very personal. As a kid, all I wanted to do was become a boxer. Jerry Quarry helped make this possible. 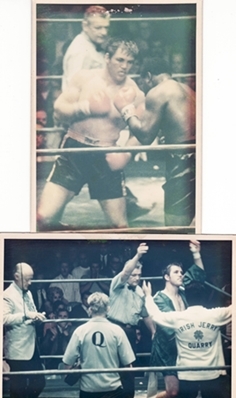 Jerry Quarry’s success and accomplishments are a part of boxing history. Being close to a boxer who won the National Golden Gloves Heavyweight title in 1965, and went on to fight for the World Heavyweight Championship as a pro, is a part of my history. When I was twelve-years-old I had a dream that was a bit unusual for a middle class kid growing up in Burbank, California. I was going to be a professional boxer. I didn’t just want to be a pro fighter . . .I was going to be a pro fighter. I set a goal for myself and nothing was going to stop me. Nobody took me seriously, but it didn’t matter, I took myself seriously. However, this was not going to be easy. There were no boxing gyms in the Burbank area, or close by where I could start out. The YMCA didn’t have a boxing program and even if it had, I was looking for a place where real boxers trained, amateurs and pros. In early 1965, the Western Regional Golden Gloves Championships were televised in the Los Angeles area and, naturally, I was glued to the TV. The heavyweight final was won by a 19-year-old from Bellflower named Jerry Quarry. Quarry scored a decision over Clay Hodges and would represent Los Angeles in the national tournament the following week in Kansas City. There was something special about this fighter and I couldn’t see anybody beating him in the Nationals. I was right.